KIEV, Ukraine -- Imprisoned former Ukrainian prime minister Yulia Tymoshenko may be faking sickness to avoid attending her appeal hearings, prosecutors claimed Wednesday. Supporters of former Ukraine prime minister Yulia Tymoshenko face riot police at a pro-Tymoshenko rally on Wednesday. Tymoshenko is serving seven years in prison for abuse of authority for concluding gas contracts with Russia in 2009, a verdict the European Union has said was politically motivated. A Kiev court this week has been hearing Tymoshenko's appeal. As with earlier hearings, her lawyers said she could not attend the hearings because of debilitating back pains. But government prosecutor Lilia Frolova was doubtful. "We get the impression that she is faking her condition," Frolova said. Prison authorities, too, have been skeptical about the 51-year-old's health problems but she was transferred to hospital in November. Clashes broke out Wednesday between police and Tymoshenko supporters outside court. Tymoshenko insists her sentence was ordered by President Viktor Yanukovych as punishment for daring to oppose his rule. Her prison term has also been criticized by the European Union. Tymoshenko has called the verdict a "lynching" by President Viktor Yanukovych, her old political enemy. 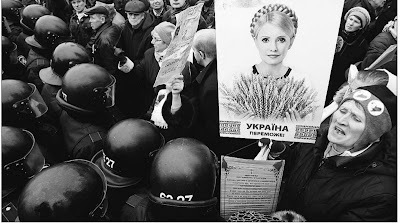 Ukraine has now charged Tymoshenko in a separate case with embezzlement and tax evasion while she headed energy firm United Energy Systems of Ukraine (UESU) in the 1990s. Ukraine and EU officials are due to meet at a Dec. 19 summit in Kiev to discuss the country's first steps toward joining the European Union. Tymoshenko's daughter, Evgenia, 31, said in Brussels on Wednesday the imprisonment of her mother should not stop the European Union signing an agreement on closer ties with Kiev next week, but Europe should impose sanctions on Ukrainian leaders. Evgenia Tymoshenko said her mother was suffering serious health problems after 130 days in jail.